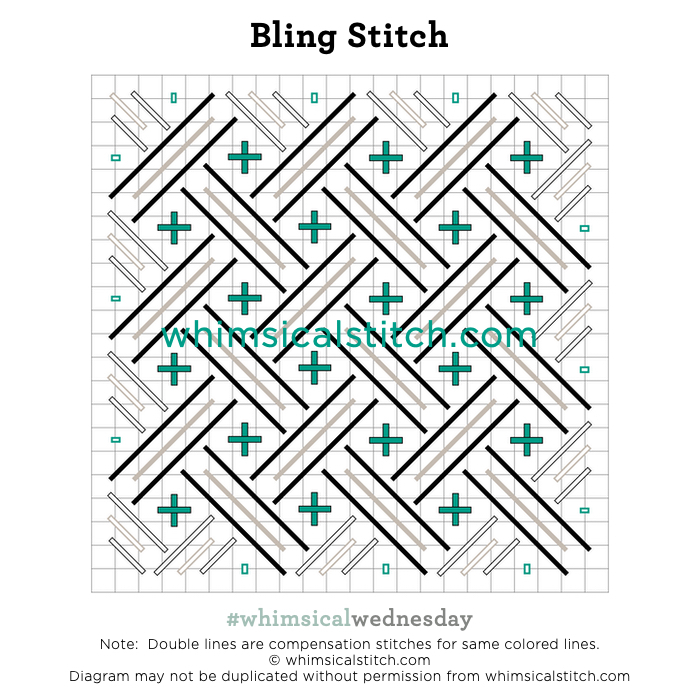 Today’s Bling Stitch variation uses Splendor (black lines), Kreinik Metallics Fine Braid (gray lines), and Flair (turquoise lines). It’s from a recently added Stitch Concept, Ruff Day in Wine Country by Maggie & Co. The canvas and the guide are full of whimsy and color. I hope you have the perfect spot for this stitch! 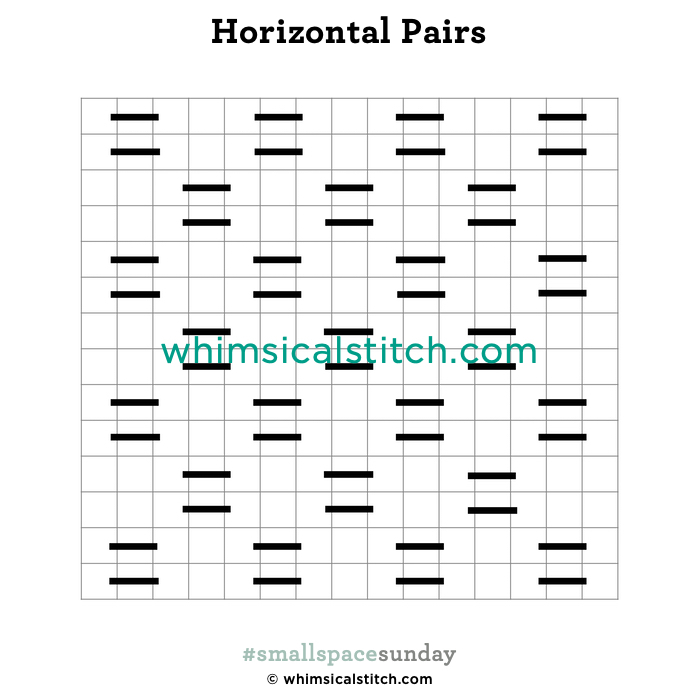 Happy #stitchingsunday! I wish you a very happy and joyous New Year! Today's stitch comes from the same Melissa Shirley fruit purse from a couple weeks ago. (Note: the stitched purse in the link is not mine.) It’s all metallic and beads. 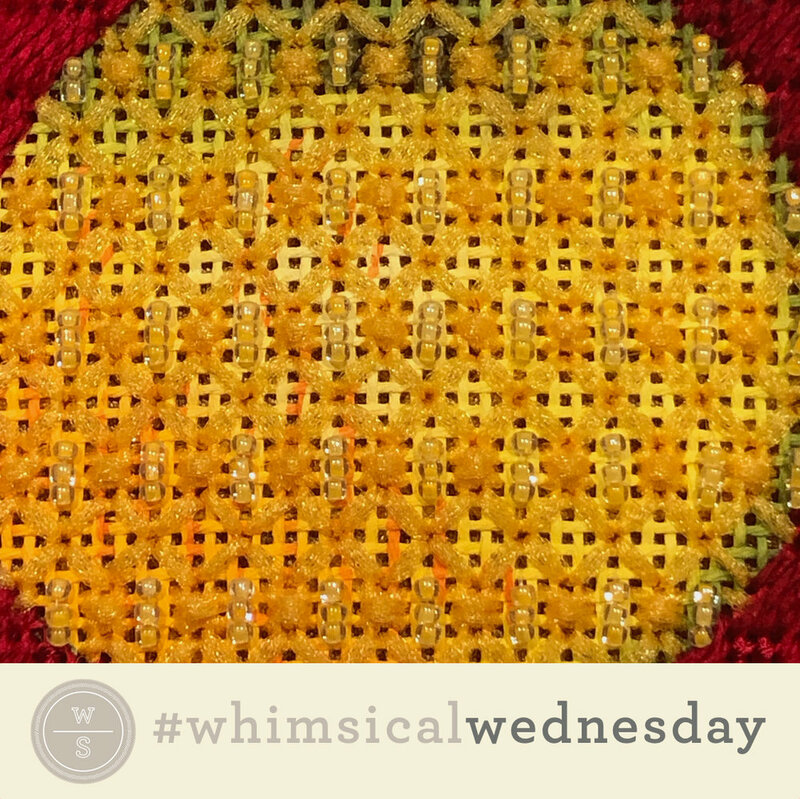 The stitched sample uses Crystal Braid (black lines), Kreinik Metallic (turquoise lines), and Sundance Box Beads (yellow circles). Yes, the diagram uses a circle to denote the box bead. Really, any oversized bead will do. As size 6 and 8 beads are more common, I chose to use a circle. Clearly, this is a standout stitch. Use it on an area you want to draw attention to, such as a dramatic dress, coat, or Santa bag. You can replace the single large bead with a 2X2 square of single seed beads. All of the threads in the stitched sample are metallics; consider using a rich Very Velvet or an elegant silk floss for the black lines to give it more contrast. Today’s #stitchingsunday comes from a sweet email this morning from a student who is stitching this stitch on this project on this Sunday. I love it when that happens! Today’s stitched sample comes from my new Stitch Concept, Moon Dance by Sandra Gilmore. It uses a single strand of Impressions (gray lines) and Glisten (aqua lines). It’s a great stitch to add direction to an area. In this case, it’s the path. The original post shows a slightly heavier version for a background. 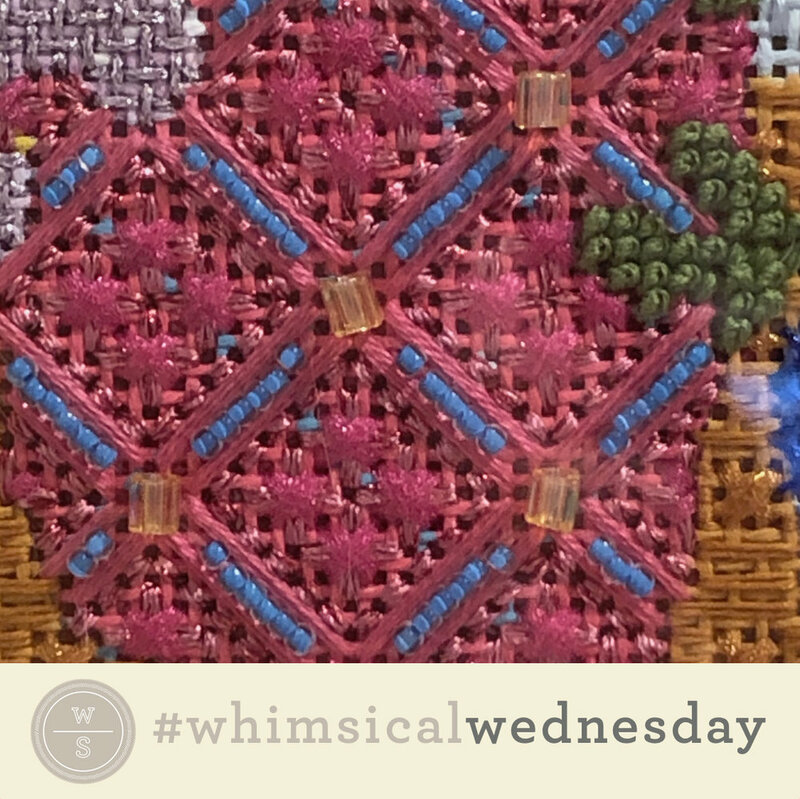 Today’s stitch comes from my friends at Aristeia in Santa Monica. I spotted this stitch and thought it was this stitch. It’s a very close cousin and, honestly, I wish I had thought of this variation myself. The stitched sample used two plies of DMC Floche (black lines) and a Kreinik metallic on 18-mesh. It was a sky on a cute little Vicky Sawyer piece. I think it would make a wonderful solid background on any number of florals. My favorite thread combo for backgrounds is a single strand silk perle, such as Elegance or Grandeur, for the black lines and an appropriate metallic for the aqua lines. If I want the metallic to pop, I go with a Kreinik. For a more subtle accent, consider Rainbow Gallery Flair or Silk Lame. Consider flipping it 90° for beautiful columns for wallpaper or a floor. I would use a Soie D’Alger for the black lines and Neon Rays for the aqua lines. It will also make a fantastic ground cover, especially for beautifully shaded snow. For the snow, use white Kreinik Metallics Fine Braid (#8) for the black lines and white Flair for the aqua lines. The shading will show through both of those threads and it’s a beautiful effect. Today’s stitch is from a beautiful Mary Lake Thompson Autumn Leaves bouquet. This green thread combo leaves me aching for Spring. 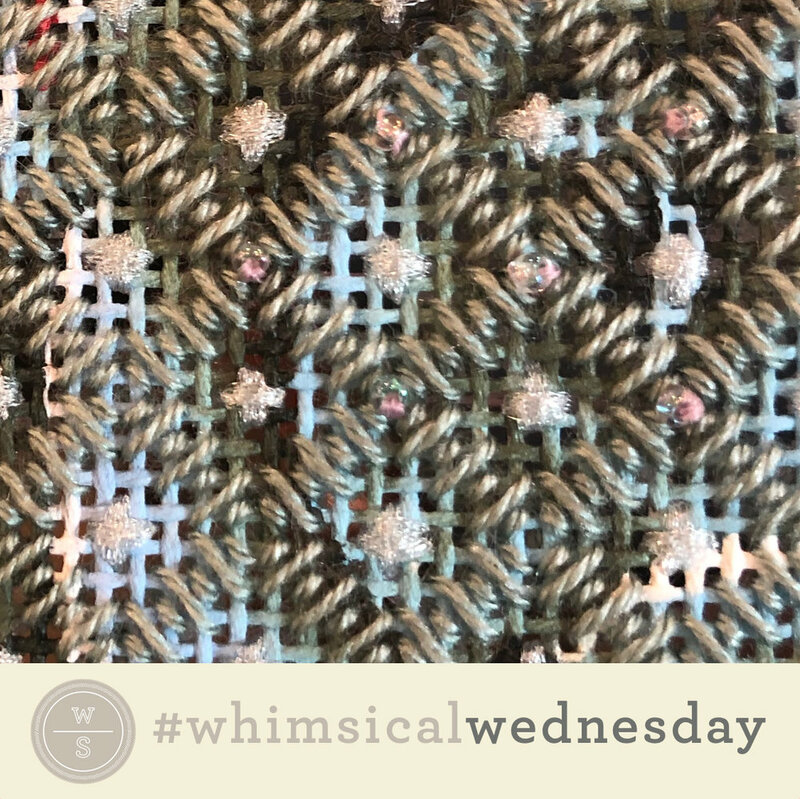 Clearly (no pun intended), this stitch is great for a beautifully shaded area or a solid area that you want to add interest to, but not overwhelm with pattern. It would be great for a large tree, a beautiful dress, or a solid background. You could use the same threads for the tree or use a single strand silk such as Vineyard Silk or Pepper Pot Silk (black lines), Very Velvet (turquoise lines), and Silk Lame (yellow lines). A beautiful thread combo for a dress stitch would be Soie D’Alger (black lines), Trebizond Silk (turquoise lines), and Entice (yellow lines). Consider adding a cluster of Brick Beading in place of the Upright Cross (yellow lines). 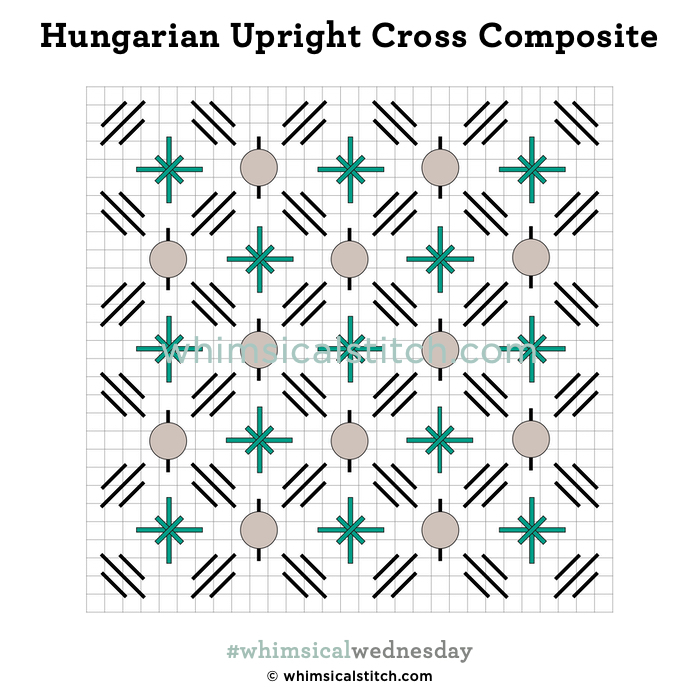 You could add diagonal stitches over one or two lines coming from the four corners to the shared center where the diamonds meet. Consider leaving the diamond empty for a more open stitch. Have fun with it and let us know what you did with it. 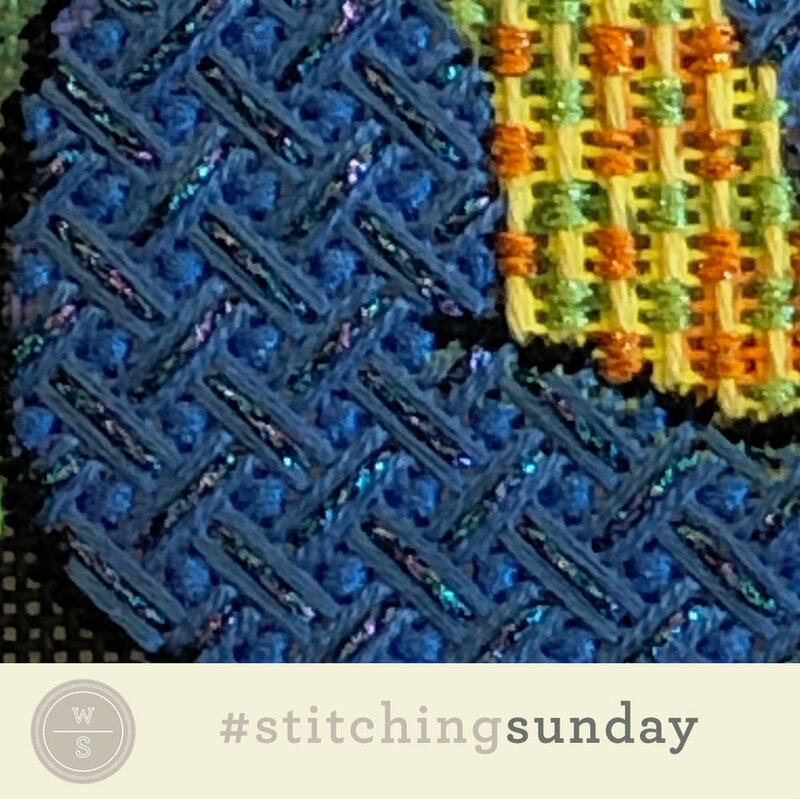 It could be a future #stitchingsunday.